•et; Description: A unique walking tour that explores the hidden gems of Buenos Aires while visiting two different neighborhoods that you will not find in guidebooks. Scroll (way) down for extensive information and detail! •et; When: Tours run Tuesday through Saturday (except on holidays). To coincide with the opening hours of the places, morning tour starts at 9:30 a.m; afternoon tour stars at 4:00 p.m.
•et; Price: USD $50 p/p all tax included. A minimum of 2 people is required. Ask about single person and large group pricing. •et; Meet: We will meet at “Plaza Primera Junta”, Rivadavia Avenue and Del Barco Centenera St., by the monument in the center of the plaza right next to the subway station. To get to the meeting point, you could take a taxi or subway (Metro) line 'A' (light blue color). If you take the subway 'A' you have to get off at Primera Junta Station. As you get off the train, go up the escalators and take the right hand exit (exit 'salida' number 2). map here. •et; Note: Our most popular 'Off the Beaten Path' tour. After this ultra-enjoyable walk you will understand Buenos Aires (and Argentina!!) much better. It includes over 10 main city sights (different from our other walks). This tour includes uncommonly visited city landmarks that deviate from your typical tourist locations. Because we enter many of the buildings that we visit you will get an extra personal experience of each place that most large walking tours won’t be able to offer. This is not a strenuous walk. At some point (time permitting) we may stop for coffee or refreshments at some emblematic cafe of cultural or historical value. Snacks, drinks, hotel pickup, transportation, foot massage, mid-life-counseling, good sense of humour and gratuities are not included (actually massage, counseling and good sense of humour are not even available!). Historic Market of Progress. Of all historic markets in B.A. it is the best preserved by far. It was declared site of cultural interest in 2001. A pulperia or gaucho’s bar (gauchos = Argentine cowboys). An old fashioned barber shop named as one of the best barbershops in the world and the only living museum of its type in this hemisphere. 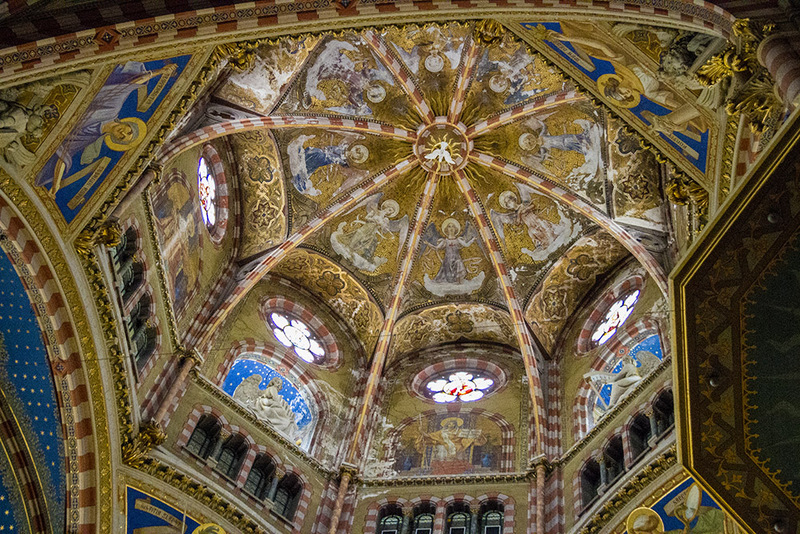 The church Pope Francis was baptized in and one of the most beautiful churches in the city. A 19th century colorful alley and one of the oldest in Buenos Aires. An art deco Methodist church. A picturesque building: The architects that came as stowaways. Las Violetas: A truly impressive 19th century tea/coffee house and bakery. 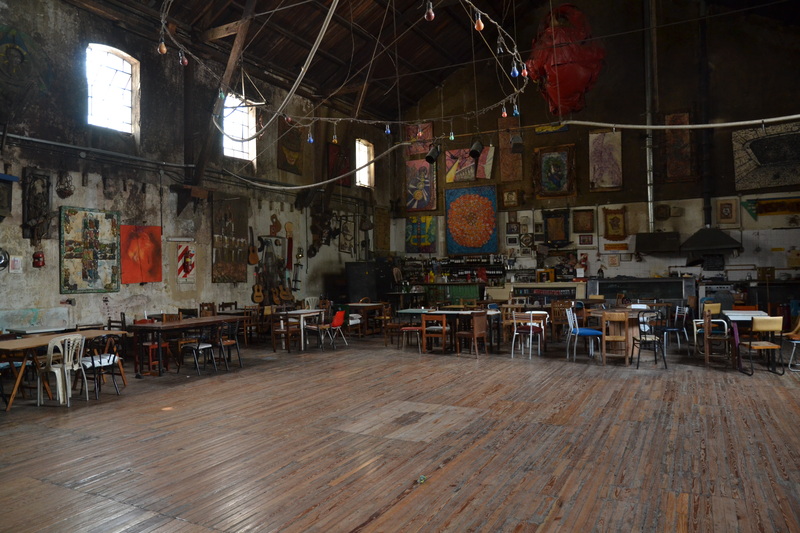 A legendary tango salon that was once used as a grain silo. This unbelievable salon, a historic building from the 19th century, will amaze you with its bizarre variety of artifacts and art. El boliche de Roberto (opcional). An 1893 tango bar. Tour Outline (abbreviated): (click on pictures to toggle size) This is the tour to get some insight into local life, to learn about our local food, to see what the locals do and to have an authentic local cultural experience in “non touristic neighborhoods”. All these are important aspects of immersing yourself into and coming to understand Argentine culture. If you seek out Off the Beaten Path locations instead of the common tourist attractions, love to listen to stories you might otherwise never have the chance to hear, and are looking to experience the real Buenos Aires, this is the tour for you. We will travel back in time to the 19th century and early 20th century to get a taste of the rich cultural and culinary history of B.A. We will visit an amazing historic market built in 1889, and there you will learn about our local food, fresh produce, etc. Of all the old markets in Buenos Aires, the historical market of Caballito is by far the best preserved. This famous and impressive 1889 indoor market is nothing like today’s modern markets. 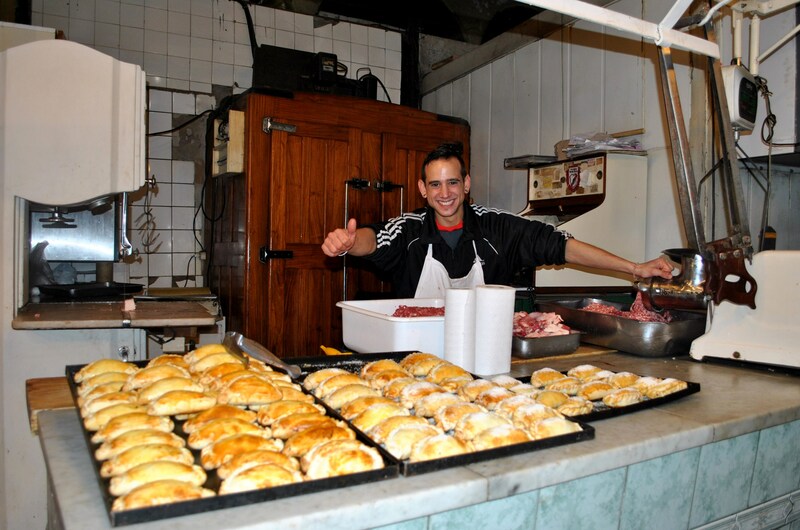 This is the place to learn about Argentine culture and food traditions. You can appreciate the fresh produce farmers bring us daily. Many of them you won’t see anywhere else in the city. Products that are available in the market are domestic and imported fruits and vegetables, all kinds of fresh meat and seafood, prepared in modern or traditional forms, such as “matambre”, “milanesas”, stuffed meats, sausages called chorizos, etc. Also, you could find Argentine crafts, and local artisanal products like cheeses, wine, etc. The market is one of the gastronomic icons of the city. Many people including chefs visit the market weekly to get a wide variety of products of great quality. The service is personalized, because the majority of shops are attended by their owners. The vast majority of shops are cared for by the original owners or by their descendants. For most neighbors shopping in this old market is like a tradition. There are those who have known the shop owners for more than 30 or 40 years. The market measures 3600 square meters (38750 ft²), nearly a block square and has 174 shops or stands inside and 17 street stores. Today the building retains its historical appearance mostly because architectural changes introduced by the various owners have not substantially altered the original structure of the market. In the '30s, the Italian style façade of the building was decorated with the market’s name using art-deco letters. The central nave, which is original and made of iron, came disassembled from London. The other materials with which it was built were brick and marble. The arrangement of its structure, the ventilation and cleanliness and its carefully planned orientation, made the market one of the most hygienic of its time. At the time the market was inaugurated towards the back of it were fields of corn and streams that people used to cross by barge. Nowadays there are houses, apartment buildings and shops. The market was mostly populated by immigrant workers, and used to supply mainly to the closest neighborhoods. There were 53 shops in total. Then as now, meats were sold exclusively at the central pavilion, which was 6.50 meters high, as this is the area with better ventilation (due to the lack of walls). At the earlier times chickens and other animals were sold alive. The chickens were in cages, and you could choose the one you wanted. Cooking oil was not sold in bottles, you had to bring your own bottle and they filled it through a funnel. There were several bakeries, vegetables and fruit shops, fish shops and a very large shop that sold seeds and legumes. 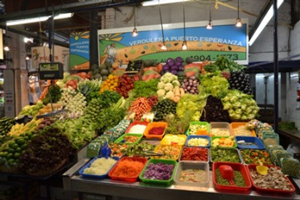 The market is also the place to taste a piece of history of Buenos Aires. Among the many stories that haunt it, one says that in 1890 it was used to recruit troops for the revolution of that year; and that at the time it was compared to the markets of Paris. The market has been closed and reopened several times. At one time it was closed for renovations, reopening in 1894. On January 13 of that year, Mr. Santiago Cangallo who was the owner announced that on that Friday the market would provide free meat to homeless families, a fact that was recalled by the neighbors throughout the years. In 2001 the City Government declared the market a site of cultural interest. 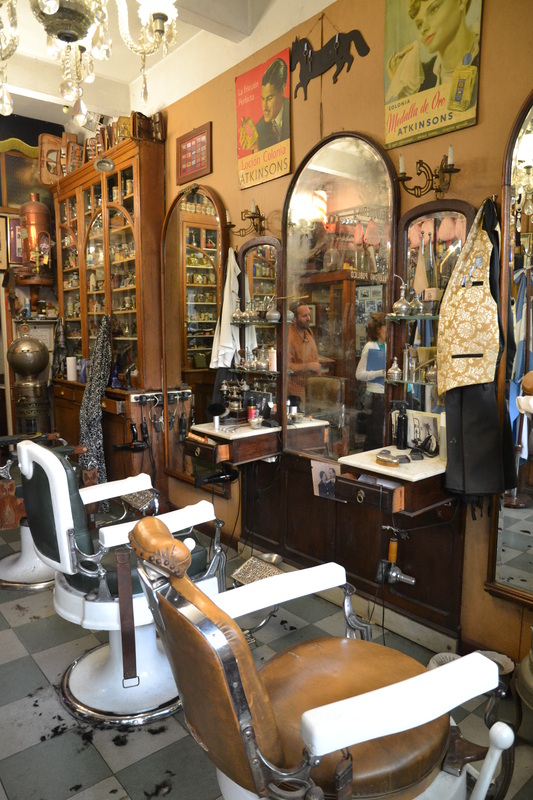 We will show you an unusual place: an incredible old fashioned barber shop that also functions as the only living museum of its type in this hemisphere. It is a very cool place that feels like it is from a century ago and it was named as one of the best barbershops in the world (with no entrance fee required). 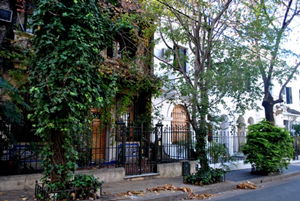 If you wish to take a trip back in time there is a special place in the ancient Neighborhood of Caballito. What makes this place so special? Miguel invites everybody to enjoy his 'cultural salon' to develop cultural and social proposals for charity. This is the chosen place in Caballito for the organization of cultural events: from celebrations of national holidays to shows with musicians and guest artists: tango dance shows, and folk and jazz music. All these events serve to help hospitals, homes or schools who need it. Pulperia or gauchos’ bar (gauchos= Argentine cowboys) In Caballito there is a window into the past: an incredible gauchos’ bar. It is also a museum. “Pulperias” were a special kind of country store, a combination of general store and country tavern that provided the few gaucho needs like yerba to prepare the national infusion called mate. Pulperias also provided the unique possibility of social distractions, joining other gauchos to drink, to chat, to dance, to gamble or to play “Payadas”. “Payadas” was the name of a sort of 'duel of words' between two or more gauchos. One of them, accompanying his words with a guitar, would share his own misfortunes and reflections with another, creating the rhymed verses as he went along. “Payadas” are one of the several elements that gave rise to the Argentine Tango creation. 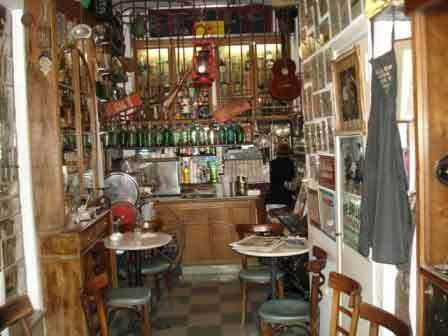 Some historians claim that tango was originated in a “pulperia” like this one. We will stroll through “the English district” discovering its gorgeous diversity of architectural styles, all set among beautiful cobblestone streets. The district was built between 1923 and 1935. Before its construction, cows were raised on the land. We will visit the church Pope Francis was baptized in. 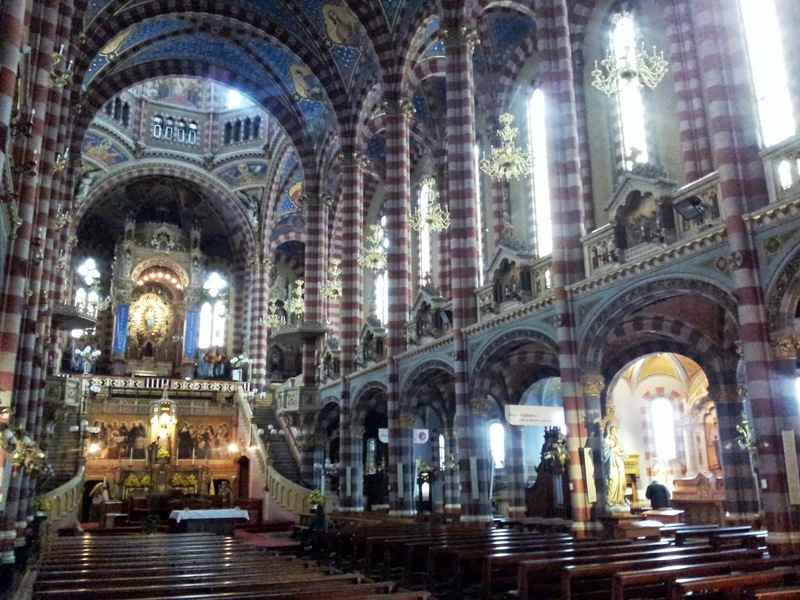 It is one of the most beautiful churches in the city and the most awe-inspiring you have ever seen! Pope Francis’ parents were married in this church and Carlos Gardel, the most famous tango singer in the world, used to sing in the church choir when he was a child. The original temple was built in 1878. This one was built in less than 10 years and the inauguration took place in 1910. The tower is 64 meters (210 ft) high. At the entrance we can see the statue of Christ. It is made of a single block of white marble. The church is really nice inside and very different from other churches in the world. It has three levels. The statue of the Virgin is accessed by two marble stairs on either side of the main altar. In the main altar, the central image is not the usual crucified Christ, but a large statue of the Sacred Heart. All the work was planned and executed by an Italian architect and a priest: Ernesto Vespignani. The building style is 'Lombard Romanesque'. 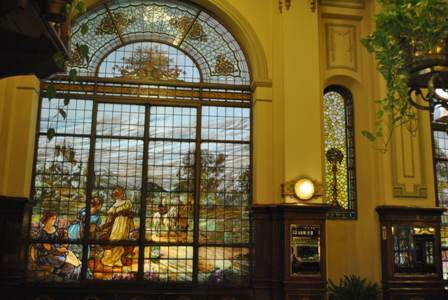 It also has large stained glass windows, hanging chandeliers with Murano glass shades, high columns (15 meters) with alternating stripes of red and beige. Many areas are made or coated with marble that Vespignani brought from Italy. The vaulted ceiling of the basilica is blue with stars. The church is decorated with thousands of flowers. It has a beautiful big octagonal dome, long benches and carved wooden confessionals. It is a place frozen in time, a historic building first used as a grain silo, then as a dairy factory, then as a meat processing plant. Finally, it was recovered as a cultural site being converted into a big tango salon, a place where people gather to dance tango. The salon has old furniture and strange artifacts and art. Finally, we will check out “Las Violetas” a truly impressive 19th century tea/coffee house and bakery with golden chandeliers, Italian marble floors, and French stained-glass windows. Some say that it looks like a Roman Palace from the movies! We will visit this amazing place to experience BA’s lively café culture. Where this café stands there was once a summer house. Together we will appreciate its truly impressive, art nouveau architecture. People who visited this place: Carlos Gardel (the most famous tango singer in the world) and presidents of Argentina. 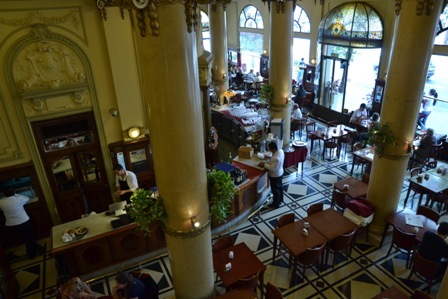 In 1977 a small group of Mothers of the Plaza de Mayo, (mothers whose children disappeared during the last military dictatorship) got together here at Las Violetas as it was an ideal place because it is always full of women having tea and pastries in order to be discreet about their meetings. Throughout the entirety of the tour we explain immigration, gauchos, tango, and the historical and architectural evolution of the neighborhoods. This information is filtered our visits to various places, each with an interesting and relevant history. Because each location is far from the usual tourist stops, the tour it allows for an authentic cultural experience. This will probably be some of the best 3 hours you spend in Buenos Aires!